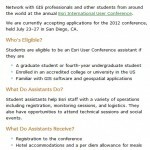 Attend the UC for free as part of the ESRI Student Assistantship Program. Great opportunity to learn and explore the world of GIS (wish I were a student again – this is a pretty good deal)! …identification of native and invasive Spartina species and their hybrids, and in the use of ArcPad software on Trimble GPS units to relocate previously-mapped invasive Spartina patches and to record treatment of these patches during treatment activities. Project Description: You’ll work with us to develop a trial storm wave forecasting atlas for use by the National Weather Service to provide emergency wave height information to mariners using a new, GIS-based software tool developed at our Center.